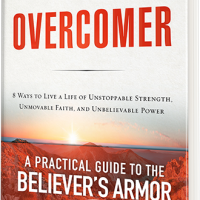 In Overcomer, Dr. David Jeremiah will teach you how to suit up for victory! Living the life of an Overcomer starts with one very simple, yet often overlooked action: putting on your armor. You’ve heard it before, from the book of Ephesians. The wonderful metaphor—the breastplate of righteousness, the belt of truth, the shoes of peace—the Armor of God. Men & Women will break into group for this study. Men will meet in the Chapel & Ladies in Holy Grounds Coffee Shop.